Give the band a listen before you decide to bid. 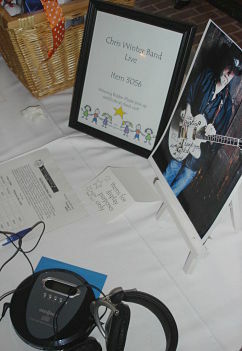 Your silent auction donations have a better chance of selling for more money when guests enjoy experiential shopping. For inspiration, let’s look at my old stomping grounds: corporate marketing. A visit to your local shopping mall proves the power of the sensory experience. Bath and Body Works invites browsers over to their in-store sink where they encourage you to use their exfoliation products and lotions. As you walk through the food court, at least one vendor will offer you a toothpick of a juicy morsel (bourbon chicken is common in my local mall) so you can taste the product before you commit to buying lunch. A walk through the fragrance counter can leave you with several different perfumes spritzed on your arm. You can smell them all, before you commit to buying a bottle. 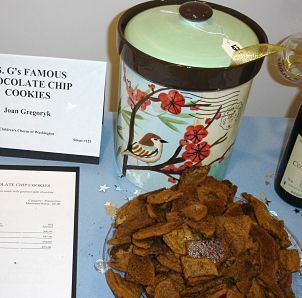 Try a sample of the cookies before you bid. Businesses know that you’re more likely to become a paying customer if you experience a product using your five senses — taste, touch, sight, smell, and sound. They are happy to give you a sample of their product because they know you’re more likely to buy after your enjoy it. Let’s incorporate that philosophy into your silent auction displays. When cookies are for sale, can you offer guests a sample? If a scarf will be knitted for the winning bidder, can guests touch the quality of the yard and feel how soft it will be against their skin? Does that chocolate cake up for bid offer a scent so heavenly that your guests can smell it across the silent auction room? Does the string quartet have a CD of their latest work playing? Is your visual display of the item fetching to onlookers? The harder you believe an item will be to sell, the more important it becomes to draw guests in. Your silent auction donations will perform better when offered in this multi-sensory shopping environment. Great thoughts Sherry. If you walk past the bakery at Disney you’ll be able to smell things baking (but I’ve heard rumors that the smell is actually piped in). Engaging ALL the senses makes so much sense. I recently attended an event that had a bunch of vendors who were displaying their “stuff” and giving free samples of any of the food items. I purchased way more than I normally would have because I got to taste and feel things…it really does work! Love, love, love this idea. What a no-brainer! I’m sending this to my favorite organizations!